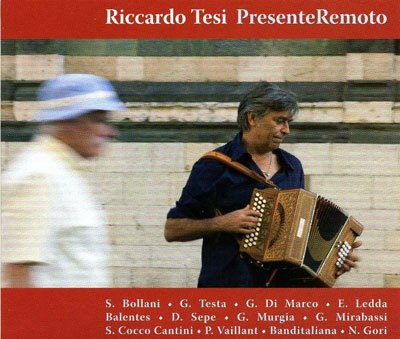 The new album by Riccardo Tesi to celebrate his 30-year career. Many friend and guests participated: the jazz pianist Stefano Bollani, the sardinian singer Elena Ledda, italian singers Ginevra di Marco and Gianmaria Testa, the French singer and mandolinist Patrick Vaillant, the saxofonist and composer Daniele Sepe, the great jazz clarinetist Gabriele Mirabassi and Gavino Murgia, Bacentes, Cocco Cantini, Banditaliana’s musicians and many others. The upcoming tour of Riccardo Tesi’s new concert based on his latest work “Presente Remoto”, the album crowning his thirty-year artistic career. As a composer, diatonic accordion player, researcher, Riccardo Tesi, a real pioneer of ethnic music in Italy, this year celebrates his long and successful artistic career with a new project, the “Presente Remoto Tour”, a concert tour presenting the new pieces from his latest album. The title expresses the creative union of the musician’s past and present, with his unmistakable and mature style based on constant research and continuous experimentation. (in December 2007, Edizioni il Manifesto) is the image of a festive session with a numerous participation of about thirty artists, friends and new and old colleagues of Tesi, all of whom significant for his career as a musician. The repertoire of Presente Remoto concert focuses on the new compositions from the album and proposes variegated evocative atmospheres roaming from italian world music to jazz, songwriter’s pieces and more classical sound. For this project Tesi has formed a new line-up, a sextet composed by himself, two well-known members of Banditaliana – Claudio Carboni on sax and Maurizio Geri (guitar and vocals) – and the contribution of Marco Fadda on percussions, Stefano Melone (vocals and keyboards) and Damiano Puliti on cello. In addition to the base sextet, some occasional guests are envisaged to take part in the concerts, such as the string quintet Archaea, florentine singer songwriter Ginevra di Marco, sardinian singer Elena Ledda, jazz clarinetist Gabriele Mirabassi and french mandolin player Patrick Vaillant.